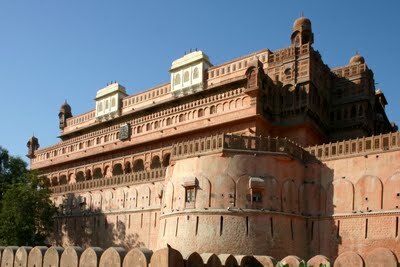 Bikaner's history dates back to 1488 A.D. when a Rathore prince, Rao Bhikaji, established his kingdom here. He was the descendant of the founder of Jodhpur (1459) A.D. Rao Jodhaji. Rao Jodhaji had five sons and Bhikaji proved to be the most enterprising amongst them. He chose a barren wilderness to transform it into an impressive city called Bikaner.Ever since the foundation of Bikaner till its accession into Indian union, Bikaner has always played an important role in the history of the country. Bikaner has produced several able generals and warriors and distinguished rulers. The most important of them was Akbar's general Raja Rai Singhji. Raja Anup Singh's tenure, who ascended the throne in 1669A.D, has been described as the golden time of Bikaner's fame and valor. Location: Bikaner, heart of west Rajasthan is known as the 'Tapo bhoomi' of great sages and saints, since pre-historic times. The holy rivers of Saraswati and Drishadwati used to flow in this region. Archaeologists believe that the Great Indian Desert, of which Bikaner is a part, was once an ocean. A belief which stands substantiated by the presence of sedimentary layers of various kinds of the precious clay, bajri etc. in the holy Kolayat area55 kms away from Bikaner. Languages Spoken Rajasthani, Hindi, English. This fort was built between1588-1593 A.D. by Raja Rai Singh, a general in army of Mughal emperor Akbar. The Suraj pol is the main entrance to this fort. The palaces are on the southern side of the fort and courtyards, balconies and windows.The major feature of the Junagarh fort is the excellent quality of stone carving, best in the world. The Chandra Mahal or the moon palace is beautiful with paintings, mirrors and carved marble panels. The phool mahal or the flower palace is decorated with glass and mirrors. The Karan mahal was built to commemorate the victory over Mughal emperor Aurangzeb. The Anup Mahal is famous for its gold leaf painting. The architectural masterpiece in red sand stone, built by Maharaja Ganga Singh (1881-1942A.D.) in the memory of his father Maharaja Lall Singh is an example of pure Rajput martial architecture. 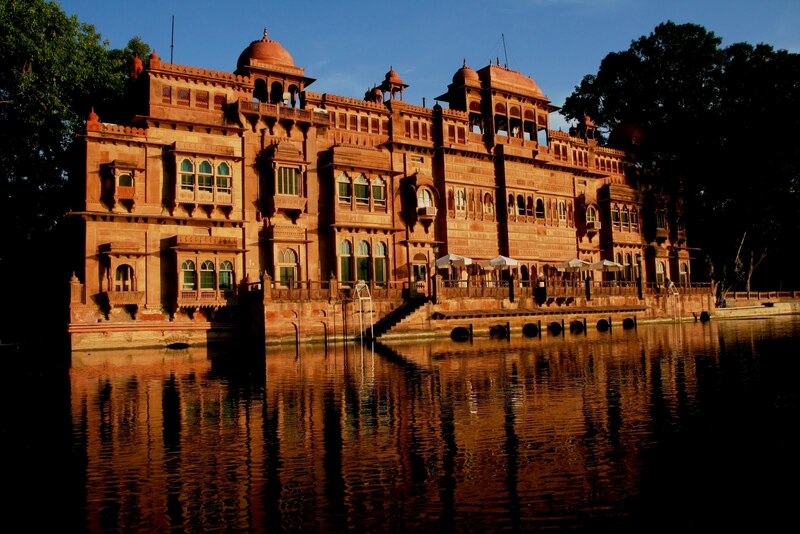 Designed by Sir Swinton Jacob, this palace has large halls, pavilions, lounges and couplas. It has magnificent pillars, richly carved fire mantles, Italian colonnades and motif of lotus in full bloom. Walls of the palace are reminiscent of the past vintage etchings, hunting trophies and old portraits. The palace has its own museum and library that is the fourth largest in the world. The royal family still lives in part of the palace. Gajner palace was summer resort of the Maharajas of Bikaner and is often referred to as the incomparable jewel in the Thar desert. The beautiful paace stands on lake. Built by Ganga Singh of Bikaner, the palace was used for grand shoots and lavish entertainments by the Maharaja. Indian and foreign royalties, Viceroys and other dignitaries have been entertained here. The amazing craftsmanship with intricately carved pillars, charkas and screens leaves one awestruck. It is surrounded by beautiful sanctuary which provides shelter to chinkaras, black bucks, Nilgai and flocks of imperial sand grouse. A part of the palace is converted into hotel. This 600 year old famous temple on the Jodhpur highway is dedicated to mata Karni, a form of Goddess Durga. The temple has huge intricately carved silver gates donated by Maharaja Ganga Singh. The interesting thing about the temple is the rats roaming freely around. They are fed by the priests and the devotees, owing to the belief that they will be reincarnated as holy men. Heritage Resort Bikaner, is a refined and refreshingly comfortable resort, exudes the mystique and beauty of the cultural heritage of Rajasthan.Modem ammenities discreetly blends into the regal splendor of a bygone era. Here the rhythm of enchanting melodies, the sheer magic of the desert and the embracing smiles of our hospitality will surpass all your wildest expectations. 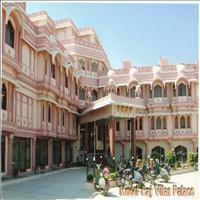 Gajner Palace is a Grand Heritage Palace of the HRH Group of Hotels. 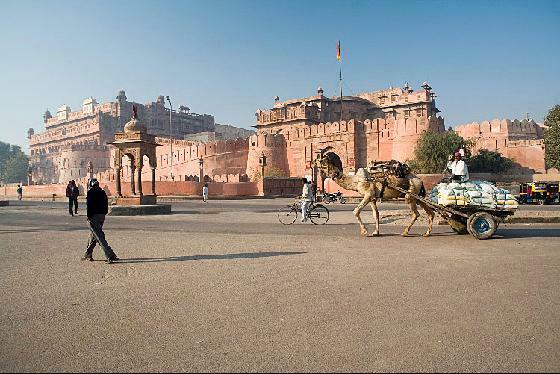 Spread over 6000 acres, the palace is a 30-minute drive from Bikaner. Gajner Palace was built on the banks of Gajner Lake by Sir Ganga Singhji, one of the greatest Maharajas of Bikaner, in the early decades of the twentieth century.The red sandstone palace is distinguished for its architectural grandeur and luxuriously appointed suites and rooms. The greenery at Gajner Palace, lawns and the chirping of birds and peacocks make it a truly memorable destination for leisure and corporate travellers. Karni bhawan was built by maharajah Dr Karni Singh of Bikaner in the 40's.All rooms are large, well decorated, comfortable and full with all modern amenities. The palace is surrounded by large sprawling grounds and lots of shady trees . Built in the year 1902 by one of the most outstanding personalities of princely India, Maharaja Ganga Singhji. The Lallgarh Palace is sheer poetry in sandstone. Constructed during the first half of the nineteenth century, it defies the bleak and rugged reality of the Thar desert. Lallagarh Palace is a complete integrated example of Indo-Saracenic architecture, a perfect example of Sir Swinton Jacob's creations. The palace has played host to a number of dignitaries from all over the world. Ever since the foundation of Bikaner till its accession into Indian union, Bikaner has always played an important role in the history of the country.